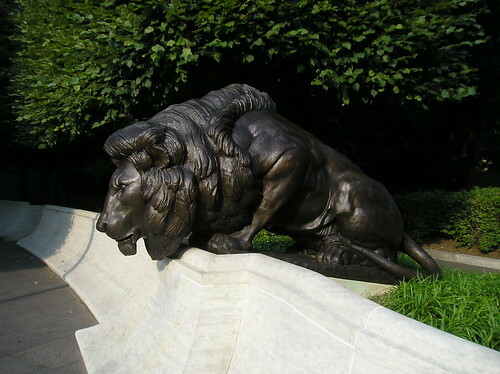 I never cease to enjoy the lion sculptures at the police memorial above Judiciary Square. Since I was there the other day, I thought I’d share a few shots. NPR’s segment, Restored Historic D.C. Courthouse Reopens, was of interest today. There’s history underfoot at the D.C. Courthouse. Frederick Douglass had an office here, and so did Theodore Roosevelt. They say Abraham Lincoln signed the D.C. Emancipation Proclamation under this roof. But by the time Eric T. Washington got there in the 1980s, the roof was crumbling. Washington is now Chief Judge on the D.C. Court of Appeals. He’s made it a priority to rehabilitate the historic courthouse. Now, after 10 years and $100 million in renovations, the courthouse is open for business again. This building was built in 1820 from plans drawn by Georg Hadfield. 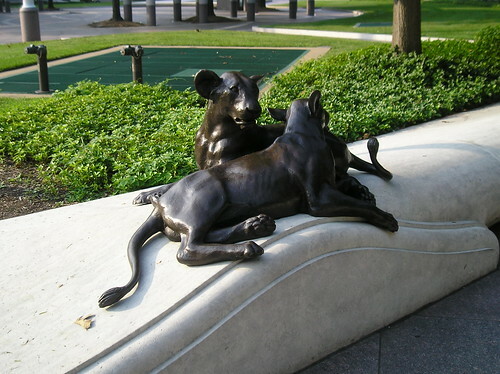 Until 1871 it was occupied jointly by the U.S. Courts for, and the municipal Government of the District of Columbia. In 1873 it became, by purchase, the sole property of the U.S. From that date it was devoted entirely to judicial purposes.